Often getting your department organized requires storage equipment to provide you with the structure you need to stay organized. 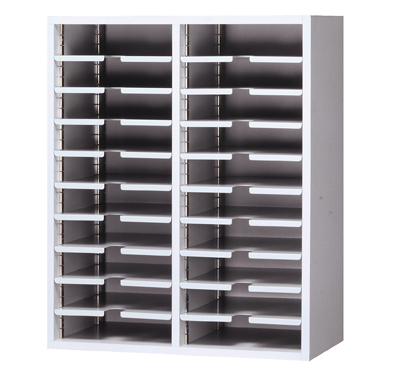 Mail sorter modules which can be procured in an assortment of sizes and number of pocket openings which are many times the answer the company needs to help them get organized. The mail sorter can be ordered in letter or legal depth. Mail master mail sorter shelves can be finished in standard, non-standard, or premium finish with customer upcharges and extended lead-times for non-standard and premium finishes. The mail sorter shell has the interior and exterior which can be finished in anyone of our laminate finishes at no extra charge. Transparent plastic label holders with cardboard inserts provided for marking are offered as an option to identify each pocket opening. Depth can be ordered in letter size (12 1/4") or legal size (16 1/4") which allows a net opening for letter sort modules of 11 1/4"W x 11 1/4"D or legal sorters of 11 1/4"W x 15 1/4"
(STANDARD) Finishes for wall hung mail sorter shelves are offered in 15 powder coat paint selections. The paint is solvent free and EPA approved. Buyers can request color chips at no charge. (STANDARD) The interior and exterior of the Mail Master sorter shell (except for steel sorter back) is finished in a high quality laminate which provides durability and appearance benefits. Custom color matching is offered if asked for, however it often results in an additional charge and longer lead-time. Color chips are available upon request for standard laminate finishes. Please take note that wall hung mail organizers have a steel shell back and are finished the same as the mail sorter’s shelves. (+$20.00) Label holders allow the organization’s manager to identify each pocket opening. If this option is ordered you will be provided the amount of clear plastic label holders with double sided tape and cardboard inserts for a personalized marking of each pocket opening. 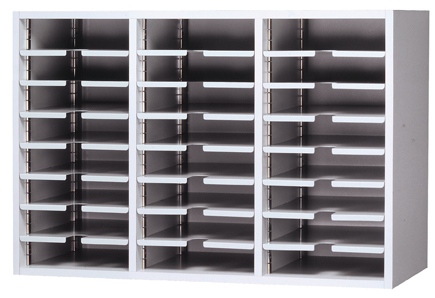 (STANDARD) 12 1/4" (Letter size) mail sorter depth stores materials that are 8 ½”W x 11” and typically is sufficient storage room for most client scenarios. (+$40.00) 16 1/4" (Legal size) sorter depth is for buyers who require additional storage space for literature, documents, or other types of materials.